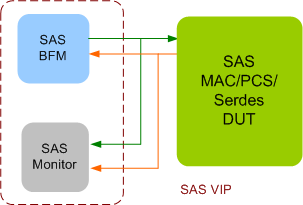 SAS Verification IP provides an smart way to verify the SAS bi-directional bus. The SmartDV's SAS Verification IP is fully compliant with SAS 2.1, SAS 3.0, SAS Protocol Layer SPL 1.0, SPL 2.0, SPL 3.0 and SPL 4.0 of the SAS Specification and provides the following features. Supports trained 1.5,3,6,12 and 22.5 Gbps speeds. Supports untrained 1.5,3 and 6 Gbps speeds. Supports Spread Spectrum Clocking Modulation techniques. Supports Expander device handling of connection. Supports Successful low phy power conditions handshake sequence. Supports SATA Spin-up and Port Selectors. Supports Parameter Storage, Mode Pages and Log Pages. Kcode & Dcode validity and alignment. Controls to inject bit errors. OOB sequence generation and checking. Callbacks for use in directed test writing. Complete Link Layer state machine. Selectable Primitive CONT and fill substitution processing. Configurable Receive and Transmit fifo latencies. 8b/10b encoding and decoding, Error injection. Configurable OOB signals and speed of operation. Single or multi-bit error injection. User defined primitives & frame transmission. Supports link layer power modes. Randomized/directed CRC error injection and checking. Ability to enable/disable scrambling on the fly. Supports Hard Reset, Link Reset and Phy Reset. Supports LBA with HDD size configuration. APIs providing backdoor access to HDD. Programmable auto-activate support using configuration. Supports Clock compensation, Connection Management , Generation of Idle cycles and Byte Ordering. Supports Expander device model features & Expander device handling of connections. Supports SAS Forward error correction encoding while in SPL packet mode. Supports Opening/Closing an SSP,SMP & STP connection . Supports Rate matching while in the SAS dword mode. Supports Management application client model for APTA. Supports Expander logical phys features. Supports PAPTA (phy layer active phy transmitter adjustment). Supports PTT (phy layer transmitter training). Supports Bit order of CRC and scrambler. Supports Primitive encoding, binary primitive coding, and extended binary primitive coding. Configurable FIS latencies, FIFO depths and FIS size. Supports 8,16,32,64 bit SERDES interface. Software Settings Preservation and Hardware Feature Control support. Supports the Non 512 Byte Sector Size. Ability to Automatic Partial to Slumber Transitions. Callbacks in Host, Device and monitor for user processing of data. SAS Verification IP comes with complete testsuite to test every feature of SAS specification. Functional coverage for complete SAS features. Faster testbench development and more complete verification of SAS designs. Easy to use command interface simplifies testbench control and configuration of Root complex and End point. SmartDV's SAS Verification env contains following. Complete regression suite containing all the SAS testcases.